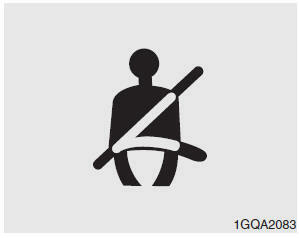 • For maximum restraint system protection, the seat belts must always be used whenever the car is moving. • Children age 12 and younger must always be properly restrained in the rear seat. Never allow children to ride in the front passenger seat. If a child over 12 must be seated in the front seat, he/she must be properly belted and the seat should be moved as far back as possible. • Avoid wearing twisted seat belts. A twisted belt can't do its job as well. In a collision, it could even cut into you. Be sure the belt webbing is straight and not twisted. • No modifications or additions should be made by the user which will either prevent the seat belt adjusting devices from operating to remove slack, or prevent the seat belt assembly from being adjusted to remove slack. 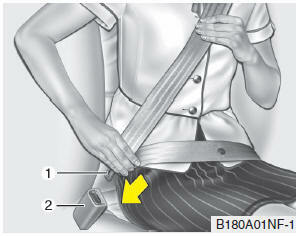 • When you fasten the seat belt, be careful not to latch the seat belt in buckles of other seat. It's very dangerous and you may not be protected by the seat belt properly. 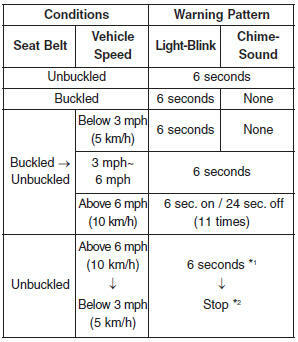 • Do not unfasten the seat belt and do not fasten and unfasten the seat belt repeatedly while driving. This could result in loss of control, and an accident causing death, serious injury, or property damage. • When fastening the seat belt, make sure that the seat belt does not pass over objects that are hard or can break easily. • Make sure there is nothing in the buckle. The seat belt may not be fastened securely.